Dogs are highly intelligent animals that require plenty of play, exercise and mental stimulation and Dog toys provide an excellent way of keeping your Dog entertained. And while your Dog will certainly appreciate the toys you give them, you may find that the thing they love doing the most is destroying them! To avoid the mess, you want to ensure you buy high quality, tough, tried and tested dog toys that are indestructible as possible! 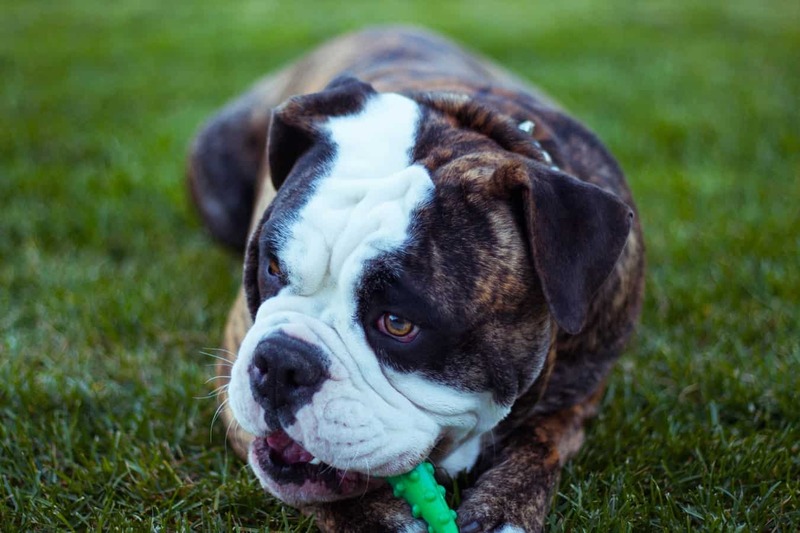 While some smaller Dogs are may only be light chewers, more powerful breeds such as Pit Bulls, Retrievers, and German Shepherds are renowned for being incredibly strong chewers, with powerful jaws, that can destroy toys in seconds. You don’t want toys that are going to fall apart and make a mess, not only is this a waste of money, it can also be dangerous for your Dog if they were to ingest damaged pieces of the toy. While it’s impossible to guarantee that any dog toy will be truly indestructible, the toys featured below are all excellent, tough and rugged choices, backed up by reviews from thousands of happy customers. These nearly indestructible dog toys should be able to withstand even the harshest of batterings from mild-mannered Spaniels, to Scrappy little Terriers and lock jaws of a Pit Bull. This Bacon Flavored chew toy isn’t to be sniffed at. If your Dog is a chewer, but normally chows down on messy, smelly real bones, then this artificial option might just be the one for you. Your dog will spends hours every day chewing on it and can you blame him? It has an incredible aroma and taste of bacon and which dog doesn’t adore bacon. Unlike some artificial chew toys, that your Dog will instantly become bored of or worse yet destroy, this tasty treat promises to remain full of flavor and in one piece for many years. Ideal for a dog who is a strong chewer, the unique curved design makes it easy for your dog to get a satisfying chew and get a good bite. This will happily take chew after chew, multiple times a day, while remaining in the same condition, albeit a few teeth marks and scratches. This is the perfect toy for an average sized dog for many reasons: First, it’s a great toy for games of fetch since it’s made from a rubber formula that makes it bounce unpredictably in every direction. Because of this, it can be used to develop good habits and solve behavioral problems such as housebreaking issues and separations anxiety by providing a welcome distraction that Minimizes unwanted behavior and reinforcing good habits. It has treat dispenser that can be stuffed with healthy treats (or perhaps peanut butter) to give your dog an extra playtime challenge. But most importantly, it is super tough and durable. KONG is renowned for making high quality and long lasting Dog toys. All in all, it’s an ideal durable play toy which can be used as a training aid for your canine. It’s also highly recommended by veterinarians, trainers and loving dog owners alike. The chuckit ultra ball is an easy recommendation to make. Unlike other dog balls, this has been designed with extreme fun in mind. We went so far as to say it was the “best ball a dog could have” in our full review. Using high-quality materials and bright attractive colors, this ball is not only durable but easy to find. Which can be a real help for Dog and owner alike should you throw it that little bit too energetically towards a bush! Did we mention it also floats in water? Another KONG product, the KONG Cozies Dog Squeaky Toys are available in a range of fun and cuddly characters. The Moose is a personal favorite, but there’s also an Alligator, Monkey, Elephant and many more. They come packed with a squeaker for added entertainment. Usually, these are the first things to break in Dog toys. But don’t be fooled, these cute, soft and cuddly plush toys are made of the highest quality materials, making them extra tough and able to withstand your Dog’s relentless chewing. Your dog will squeak it, shake it and chase it, run wildly around the whole house, chew a little on it and sleep with it. They’re also easy to clean, you can wash them by hand or just put them it into the washing machine and they’ll come out looking almost like new. Sure, you want your Dog toys to be extra tough and indestructible, but you also want to provide your dog with something that stimulates the brain. Smarter Toys allow dogs to work for their food and gain healthy mental and physical stimulation. The IQ Treat Ball is a fun pet ball to make your pet’s’ treat time more amusing and full of vigor. It can also help prevent them from indulging in destructive behaviors. The easy to fill ball features an insert that allows you to adjust the difficulty, determining how hard your dog has to work to get treats out of the ball. Meaning it’s suitable for the least to the most intelligent dogs! Offering a challenging quest for them to extract the delicious treats. The ball is easy to clean. All you have to do is twists apart quite easily, into 3 separate parts that can be washed by hand. The one downside is that on hardwood floors the ball makes a lot of noise, with the food rattling around and the ball banging into the baseboards. This value-packed Dog toy selection comes with a range of chew toys. From Chickens to Eggs, Footballs, and Burgers. There’s sure to be something in this fun-filled toy box to provide endless hours of fun for your four-legged friend and keep them entertained. This is a great idea if you are preparing for the arrival of a new puppy. These rubber toys pride themselves on being durable. And claim that unlike other toys, they won’t be shredded within minutes! The high-quality materials used are also non-toxic, meaning they are perfectly safe for your Dog. They are even throwing in a free travel bowl, which is handy when your dog gets thirsty whilst out and about. This large and durable chew rope is the Ideal toy for even the most aggressive chewers. It’s a tough rope that is knotted into three balls and is ideal for a game of tug of war. These toys are created for bonding, and whether you play tug of war, fetch or pulling these toys are sure to make the quality time with your favorite friend even more rewarding! If you want to give your dog a special treat, this chew toy will have your dog go crazy in excitement! You can use it even if you have one of the strongest dogs around. It’s the best rope for aggressive chewers. Not strong enough to play with your Dog? It doesn’t matter! You can let your dog play alone without worrying. The construction is designed to eventually allow dogs to unwind the product but it will take many months for your dog to accomplish that. Rope toys are also great for Dogs with dental issues as they act as a natural floss! These adorable, cute and cuddly bears will provide hours of entertainment for your dog. It creates a unique play experience for dogs by encasing a classic braided rope toy in a plush bear. It combines the cuddly and soft exterior of a stuffed animal with the durability of braided rope, from the inside the braided rope is tied with knots at each appendage and at its center and head to hold it in place. Your dog will love chewing on the toy and the rope inside. The toy also contains a squeaker at the knot in the center of the body to attract your dog’s attention and provide even more excitement and encouragement. As ever, Kong uses the highest quality materials ensuring years of fun. This rather odd looking dog toy resembles a freshly skinned animal pelt and features no messy stuffing which makes it last longer than regular plush dog toys. Because there is no stuffing for your dog to rip out, they can’t possibly make any mess! Instead, these are designed to provide hours of entertainment with 2 squeakers, 1 in the head and 1 in the tail for double the fun! Now your dog can enjoy long lasting play while flip-flopping the stuffing free skinneeez Stuffingless Dog Toy. This toy brings out your dog’s natural hunting instinct whilst also being a great toy for a game of tug-of-war. Have we saved the best until last? This is an ideal toy for even the most powerful chewers, the ultra-strong, ultra-durable, black rubber compound ensure this toy can handle even the most relentless chewers. Stuff it with treats, pastes or other goodies before leaving and play hide-and-seek to provide great physical and mental stimulation that gives your dog something mentally challenging to do and cure the boredom blues that lead to destructive behavior. It is even more durable than the classic original KONG (also featured on this list) and makes the perfect big-bite puzzle when it’s stuffed with your pal’s favorite treat. It’s ideal for a game of fetch since it’s made from a rubber formula that makes it bounce unpredictably in every direction. All in all, it’s great for focusing your dog’s attention and chewing instincts as it’s used worldwide by police, drug enforcement, and military K-9 teams as well as being recommended by veterinarians, trainers and dog professionals. What’s your favorite Indestructible Dog Toy? Have we missed a chew proof toy from our list? Perhaps you don’t agree with our choices? Let us know in the comments and we’ll be sure to keep the list updated with the best toys as they become available.